It’s flat. You don’t have to worry about hill training. Although there are some speed bumps. Only enter this if you're confident about being able to climb these. Marshals are brilliant, enthusiastic and helpful. And will keep as close eye on your kit. You can’t get lost so long as you keep the sea on your right. Unless you walk the wrong way out of the checkpoint and back the way you’ve come. No-one would do that. Cough. Day two had some beautiful scenery. And some more sea wall. You get to laugh at your friend’s inability to climb over stiles without making creaking and groaning noises. This was still amusing after the 50th time. It’s 77 miles along a seawall. 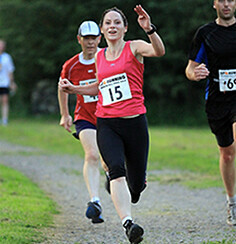 Excellent for mental strength as it’s the outdoor equivalent of a treadmill. It’s dead flat so you’re using the same muscles over and over. Think how strong those muscles will be. Like Popeye but without the spinach. Free parking all weekend and kit transported to halfway point, checkpoints and finish. The trail is just wide enough for one foot and cambered to the left. But this is good if you’re shaped like a hermit crab and want one massively muscled side. I took photos. They’re ALL the same. You can save on film. Excellent for boredom threshold training. The sea wall winds (in straight lines) in and out of the marsh and mud areas so you can see places in the distance - an occasional bush or pole sticking out of the sea - but don’t get there for an hour. I never knew how exciting passing a bush could be. You get to camp at a pub halfway. Pub is awesome. 5am cockerel is not. Take earplugs. Drink cider. You get to appreciate the little things. I never knew how amazing a lukewarm shower, a tub of Vaseline or a plate of chips and beans could be. Pretty damn amazing. A chorus of ‘good lucks’ sounded. “Well ... I paid to do it.” I said. I got a sea of blank faces in return. Seems they thought I had to run these events as some sort of punishment. Like some form of community service that involved chafing, eating massive amounts of snacks and wearing the skin off my feet. 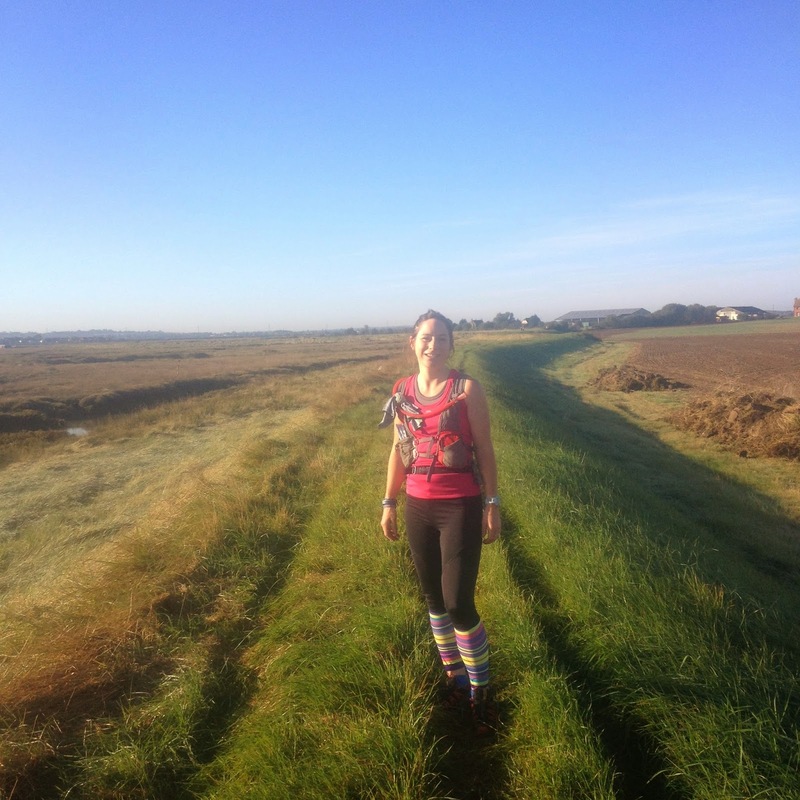 Saltmarsh 75 is a 2-day run in Essex and follows the entire coast of the Maldon District from South Woodham Ferrers to Salcott. It’s 75 miles, with an overnight camping stop at The Star Inn in the village of Steeple. The race route follows the public footpath along the top of the sea wall coastal defences as much as possible so is extremely flat (the highest point en route is 15meters above sea level) and navigation is very straightforward ... just keep the sea on your right. I almost didn’t make it as far as the A14 when an old man in an ancient Jaguar pulled out in front of me on a fast A road. In panic, spotting my car at the last minute he slammed his brakes on blocking the road. Managing an emergency stop from about 50mph, I’d pulled the car to a halt about 6 inches from his front wing. Can I claim shock and go home and eat all the snacks I’d packed for the ultra on the sofa instead? No Sarah. Woman up and get going. 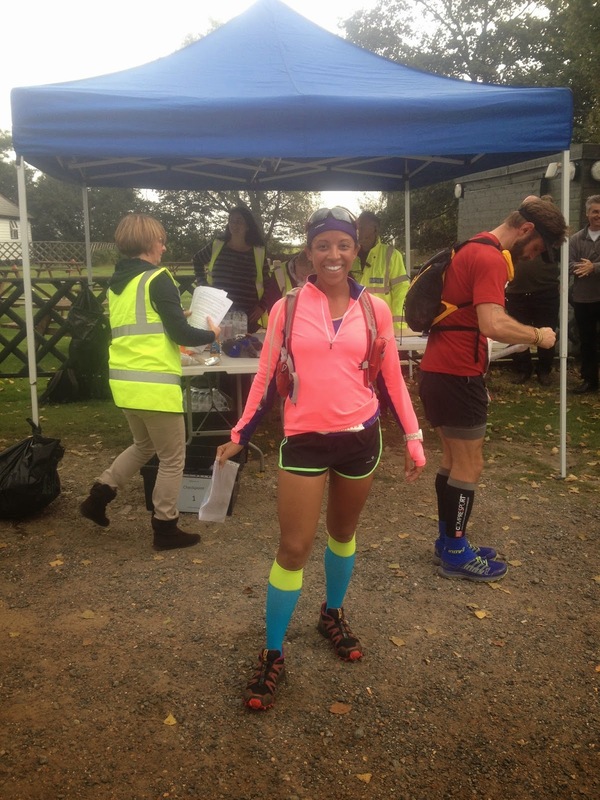 Angela is depending on you and there’s 75 miles to run. I’d wanted a leisurely bath as was unsure what the facilities would be like at the halfway point but I had to be content with a shower. 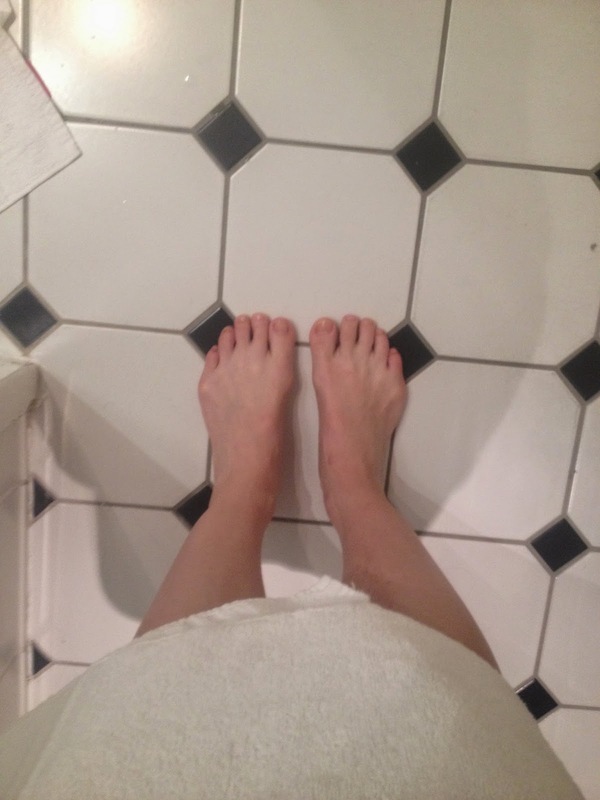 Took off the last pair of knickers I'll be wearing for 2 days and looked at my feet. 90% of my toenails are pink. This is unlikely to happen again for a long time. I took a photo as proof. I knew I’d overpacked when the chap next to me passed a tiny pop-up tent and a small rucksack to the race organiser to put in his van. I tried to pass up my massive crate to him but failed due to the weight. He looked at me dubiously as he lifted it for me. “Hang on,” I said. ”There’s more.” I went back to the car and returned waddling under the weight of a massive bin bag filled full of sleeping bags, blankets, kit and food and duct-taped shut. The start was at Marsh Farm which boasted a children’s soft play centre, pigs, clean loos and a proper cafe. None of the ‘crouching over a portaloo’ and ‘hanging around the burger van’ like usual. Registration was very easy. I was number 6. I like having the low numbers as it looks like I’m a good runner. I’m not. My surname is just near the start of the alphabet. Saw a few familiar faces which was lovely. Paddy who I’d run part of the Stour Valley Marathon with, Angela who had talked me into this and who had decided a 2-day 75 mile run would be a good first ultra. Palm/forehead. But why do things by halves? Kevin Payne who was Race Director of the Stour Valley Marathon I’d liked so much and Simon Moran, an MdS finisher who was jealously guarding his swanky new Garmin from me as I’d expressed a magpie-like longing for one of these previously. Trying to be organised, I’d warned the others when we had the 10 minutes race brief warning, then promptly got stuck in the loo queue. It’s like a race law. As soon as there are only minutes left before a race start, I’m automatically desperate for a wee. It’s like a Pavlovian response but without the drooling. As this was a children’s farm, the loo doors were worrying very low – almost like saloon doors. As a result, the queue started from about 6 feet away. I didn’t like to queue too close in case I unwittingly made eye contact with the occupant of the stall. That would be off-putting for everyone. After finally exiting the loo everyone had vanished which is never a good sign. I sprinted to the race briefing which was just beginning ... and full of dire warnings. Avoid the adders, assume the stiles are all broken and we’ve got these brilliant rescue vehicles. Ok. So even for the accident-prone me, I could manage even more interesting injuries than usual. But at least I’d be rescued quickly. The race briefing ... "Don't piss off the adders"
We were set off by the Mayor of the town and I was very impressed by his neckful of bling. How many miles would we have to run to get a medal like that? Despite it being October, the sun was very warm and the forecast rain and storms seemed unlikely to appear. There weren’t even any clouds threatening on the horizon. Running down the rough farm track, it felt as though we could run forever. We held a nice steady running pace at about 9:10 min/miles. And the occasional stile to climb over stopped us from running off too fast. We all had a nice chat at the stiles as the field hadn’t yet opened out so it was a chance to check out everyone else’s race vests and trainers. Some of these runs are like a fashion parade with all the new kit although lycra and rubber tends to feature heavily. Like a fetishists fashion parade then. As per the race briefing, a lot of the stiles were very broken and damaged. With the amounts of moving wood and rusty metal, it was like an obstacle race but with tetanus and splinters. However it was also a lovely peaceful run. We passed through the Blue House Farm nature reserve and just to throw in a bit of temptation – the 500 year old Ferry Boat Inn. However, I had to be content with my hydration tablets and water bladder as Angela wasn’t stopping. We chatted to the others around us and I tried not to run too fast or eat all my snacks in the first hour. However I DID have the chocolate bananas open at the first checkpoint. They were melting due to the warm day so it seemed sensible to eat them all at once. Got to be sensible, right? We were at the first checkpoint very quickly, no need to navigate as the field hadn’t yet spread out and there were plenty of runners all around us. The checkpoint was a gazebo in a car park with flapjack bars, jelly babies, crisps, malt loaf and ginger cake and with the soon-to-become familiar Saltmarsh 75 quill flag We had to give our numbers to the marshal, pick up the instructions for the next section and then we were free to go. 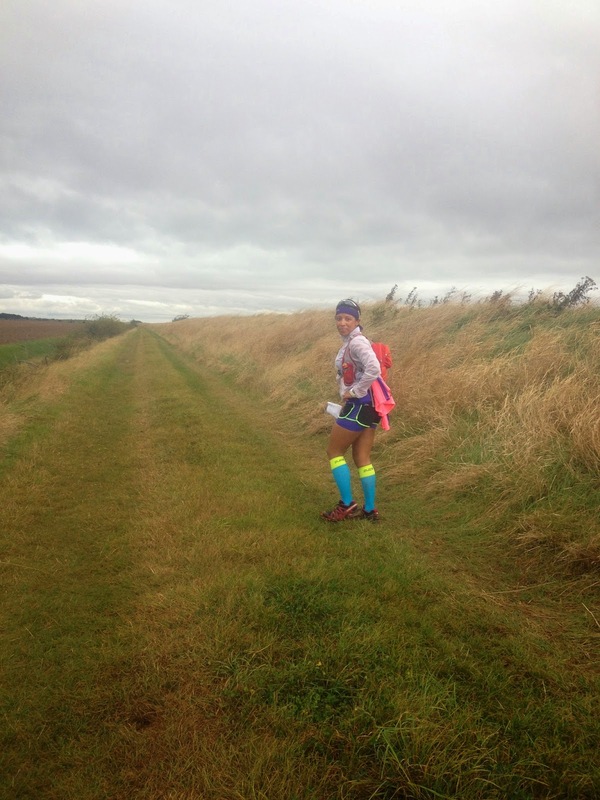 We grabbed some jelly babies then I accidentally started something I’d keep up at almost every checkpoint. I started running the wrong way. I was redirected by a marshal. Sigh. This stage contained the first of only two ‘hills’ on the whole route. Known locally as Creeksea Cliff, we walked the 15 meter climb – while eating more snacks, of course – and ran down the other side with aeroplane arms and the appropriate noises. If there are only two hills, we can’t waste one. Despite this, Angela insisted on walking over the speed bumps as apparently “they definitely count as hills”. I had to agree. On a course with a massive 15m elevation above sea level at its highest point, we had to be careful not to tire ourselves out on the hills. Erm ... speed bumps. After this, we were back on the sea wall, grassy underfoot and flat. The scenery was silent and lonely and we passed Bridgemarsh Island in the estuary and the quiet village of Creeksea. Creaksea is supposed to be the place that King Canute tried to push back the waves. He may have been unsuccessful but at least he tide. The first 13 miles went past in a blink. Wouldn’t it be nice if we found it all so easy? We’d be finished before we knew it. 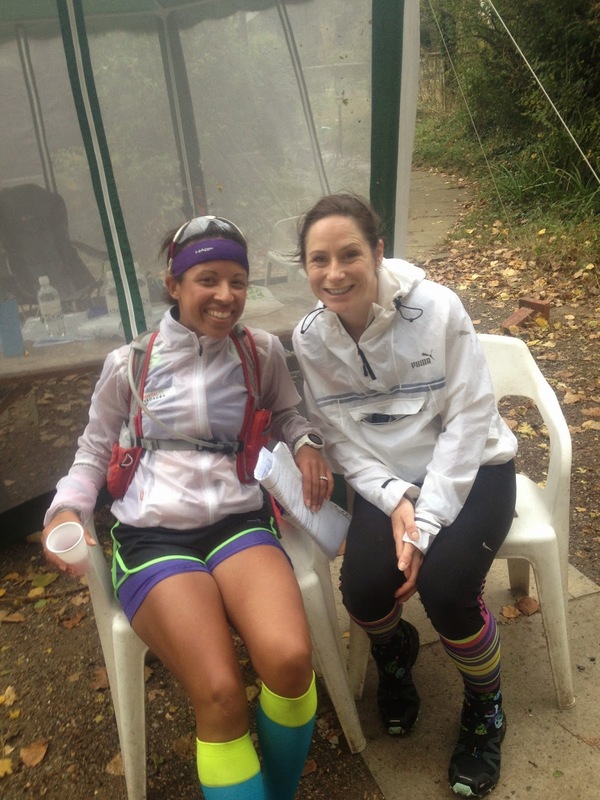 This ultra running is SO easy! 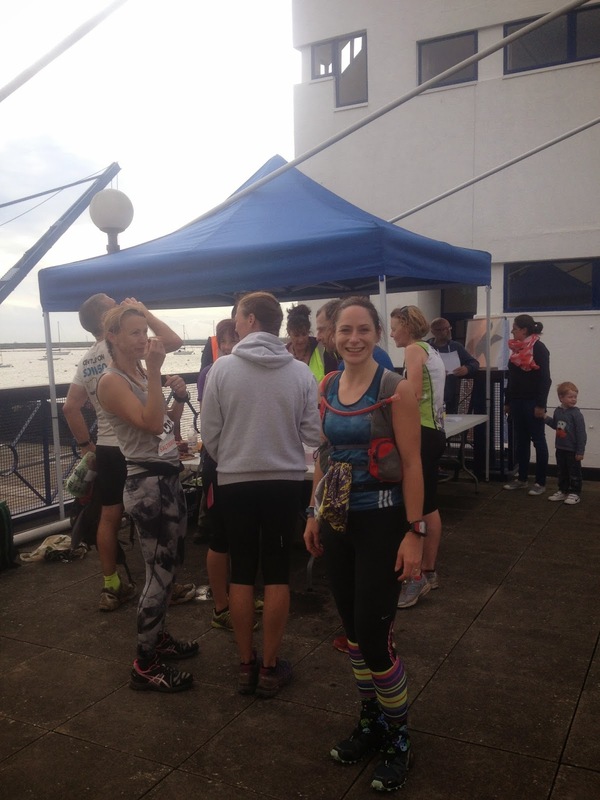 The 2nd checkpoint at 13 miles was in the middle of the town of Burnham-on-Crouch. And coming into the checkpoint, we received a hero’s welcome. I checked behind to make sure I wasn’t being shadowed by a celebrity. Nope. This was for me! AND I’d only run 13 miles. The applause is going to be deafening when I’ve done a marathon distance!! I re-taped my toes, Angela had some snacks – these two points weren’t related - and we set off. As this was supposed to be a difficult section we decided to do a 12 minute run, 3 mile walk strategy from the start so we didn’t end up tiring ourselves out before we’d even hit halfway. This part from Burnham-on-Crouch to the Bradwell Othona Community was apparently the longest and the toughest section of the event. It was over 13 miles long, remote and very exposed so even a moderate easterly wind could make this section extremely challenging. It had been described by Robert MacFarland in his award winning book, Britain’s Wild Places, as ‘…the darkest, loneliest place in Essex’,. It certainly felt it. Everything about this section sang monotony. We were about 10 metres above the sea on our grassy wall and to our left was fields or marsh. Nothing else. It was certainly lonely and desolate. After a few miles of this I felt desolate. Another 62 miles of this? I’d go absolutely bonkers. In fact, twitch, gibber, I wasn’t entirely convinced I wasn’t already. Gibber, drool. Holliwell Point, at the mouth of the Crouch is said to hold the wreck of Darwin’s Beagle. It would have been a joy to see anything at this point – a shipwreck would have been extremely exciting. Even a bush would have been exciting. All that was here was a grass bank. A grass bank uncomfortable to run on. The wind was blowing at us. My plantar fasciitis was hurting. My head was bored. I was grumpy. There was sea on my right and identical fields on the left. Nothing else. Occasionally there was a stunted bush. I took some photographs. They ALL looked the same. Ooh! More more sea wall! Every now and then we’d see another runner or walker in the distance. The sea wall was completely flat but cambered to the left so your left foot was always slightly lower than your right foot. It would also twist or turn – but at right angles like crenellations on a castle so the landmark or runner you’d seen might be half a mile away in a straight line but 3 miles away with the twisting of the sea wall. You could view the run as a religious experience. It would be very similar to how I’d expect purgatory to be. Frustrating, monotonous and difficult. And never appearing to get anywhere. That was the tough part, it just didn’t feel as though you were moving forward. Once for an exciting hour a German pillbox came into view. We watched it. It didn’t do anything. We passed it. Eventually. We came to a section of concrete – huh! Something different to run on! - and there in the distance, was something strange ... a gazebo! The local running club, Dengie Hundred Runners had set up a water stop. They’d had quite a challenge stopping their gazebo blowing away but had managed to hold it down and were providing an additional aid station to the Saltmarsh competitors. We love you Dengie HundredRunners! The marshal there told us it was the longest uninhabited stretch of coastline in Britain. I could well believe it. We carried on running. The concrete changed back into the grassy track of before and the landscape merged back into what it had been before the water stop. 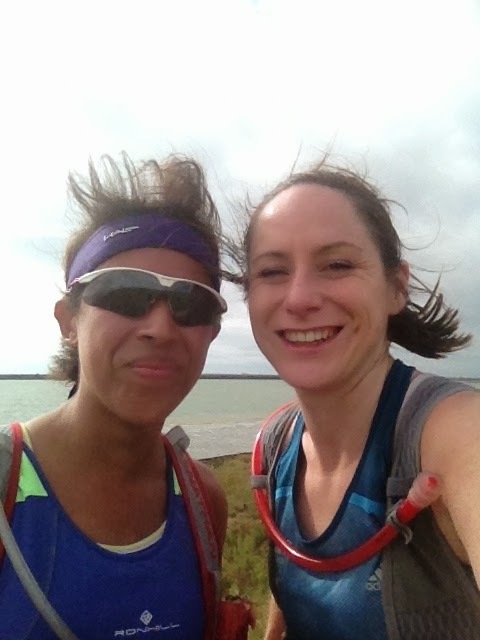 The Saltmarsh 75 had been described on the website as “An exciting walking / running challenge along the Essex Coast.” Really? REALLY? 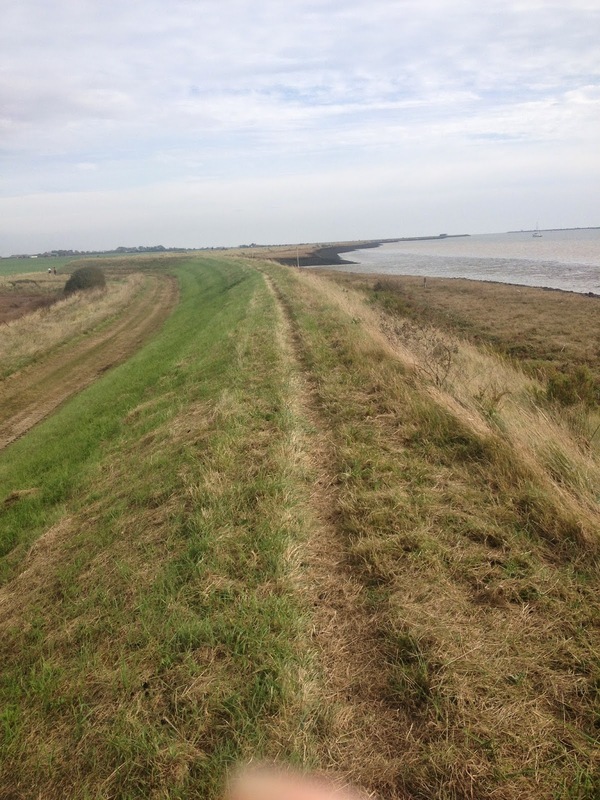 It has been a challenge with walking and running along the Essex Coast but it has been the very opposite of exciting. I couldn’t think of much that would be less exciting. It was the outdoor equivalent of running on a treadmill. Then the sideways rain started. We did a quick change into waterproof kit. Despite the warmth of the day earlier, the storms had been forecast so we were prepared. Despite this and due to the wind and lack of shelter as the sea wall was completely exposed, everything quickly became drenched. We were now cold, bored AND wet. I was not happy. I was VERY not happy. And I had a dilemma. How do I tell Angela I want to drop out of the run? How do I tell her that there is no way I’m doing day 2? What’s the point? I can be bored in the warm and dry. I started sulking. Luckily because of the wind and the rain, it was impossible to tell. I was still sulking though. There was a high point though. For one brief moment, we thought the rain almost stopped. We looked at each other and started cheering. It immediately started raining again. Stupid weather. Stupid running. Stupid sea wall. The race instructions directed us off of the sea wall onto the track beside it for the last little section before the checkpoint. However, the wind and rain was coming from the landward side so there was no respite except for when we passed one of the low bushes which briefly stopped the battering. Two figures were coming towards us through the wind and rain and they turned out to be Angela’s friends, Rob and Lorraine, runners themselves who held the Guinness World Record for the fastest 5k dressed as a camel! They ran with us into checkpoint 3 at Bradwell Othona Community at 28 miles. This was next to the Grade I listed St Peters Chapel, the oldest intact Christian chapel in England, dating back to 654AD. It would have been lovely to have a proper look but we were cold, wet and miserable. We were in the middle of an old World War II fighter plane training area and the remains of artillery and aircraft paraphernalia could be seen at low tide. And probably when everything wasn’t obscured by pelting rain. I tried to run the wrong direction out of the checkpoint. Only I can get lost on an ultra that goes in one direction along a sea wall. I got turned around and then we left the checkpoint (again but facing the right direction) and the shelter and then stopped, standing in the rain waiting for Angela to finish re-arranging her kit. A shed stood open opposite us, displaying a collection of wellies. Dramatic amounts of wellies. Told Angela we had better start moving as our rustic Essex cousins had obviously been killing and eating hikers lost on this path for years and saving their wellies. She gave me a strange look, but we started moving again. I then remembered Angela was from Essex. We could see the windmills of Bradwell’s wind farm for miles and miles. The view never changed. They were just part of the background, getting slightly bigger, then slightly smaller. Bradwell’s decommissioned nuclear power station sat on the horizon for a long, long time. It was 2 buildings and 2 cranes in symmetry as though the decommissioning had to be done on each building at exactly the same time. It was strange seeing what looked like an office building that wouldn’t look out of place in London, sitting on the desolate and windswept shore. As we came closer, the wind got even worse and we made the decision to move off the sea wall, down onto the track down by the side of the power station. Big mistake. We immediately found some mud. Nope. This was Saltmarsh 75 mud. Like normal mud but WORSE. As we walked across it, it stuck to our shoes in layers, taking us back to the days of the Spice Girls and their platform trainers. 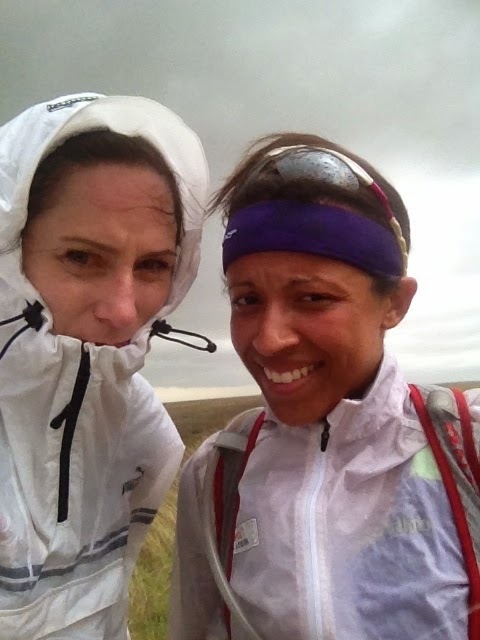 We were the miserable, ultra running, muddy equivalent. If Pop had the Spice Girls, ultra running had us. The Mud Girls. No-one said it was glamorous. We plodded on through, each foot getting heavier and heavier. Angela and I looked at each other. We were at least 5’8 by now. This was getting ridiculous. There was nothing around to scrape the mud off though so using the weeds on the banks we managed to reduce our height to abut 5’6. Still taller than normal, but with less weighty shoes. Another mud patch. Maybe if we RAN across it, it wouldn’t stick so much. I was obviously suffering jelly baby poisoning by this point as it seemed a really good idea. Needless to say it didn’t work although according to the noises Angela was making, it looked hilarious from behind. We came off the sea wall to find the checkpoint at Bradwell Waterside, the pavements and roads feeling unfamiliar under our feet. We came into the checkpoint to discover there were only red and black jelly babies left in the jelly baby bowl. Maybe they were starting some sort of union against having to run in the rain. Sign me up jelly babies. Sounds good to me. Didn’t stop me eating them though. Getting to a checkpoint and out of the wind raised both our spirits and separated our run ahead from the long trudge earlier. This section was described as “Another peaceful section ...” I was starting to get suspicious of these sort of descriptions and decided to interpret this as “Another section encompassing miles of sea wall and absolutely sod-all else ...” My suspicions were correct. We navigated the sea wall, dripping with rain and with water in our ears. We finally turned off it to get to the final checkpoint and under the shelter of the two walls. Two walls but it was blissful to get out of the wind and rain. We were both soaking wet and cold but when the marshal at St Lawrence asked us whether we were going to continue it surprised us. Yes of course we were carrying on. We only had one more section to go – why would we stop here? Besides it’s raining like mad here, blowing a gale and our tents and warm dry clothes are still 3 miles away. Angela’s husband David had come to meet Angela and asked us if we wanted hot chips from the chip shop when we reached Steeple, the finishing point of day one. This sounded AMAZING and a good reason to plod a bit more quickly towards the finish. We weren’t going to drop out now, but we were pretty miserable and just wanted to complete the day. Later we found out that 33 people had dropped out by this checkpoint. Out of a starting list of about 150 and with only 3 miles to go. We turned off the sea wall. Finally. We would have cheered but were too wet, cold and grumpy. And wanted to save our cheering for when we got our chips. We got to a footbridge with bar across it at about knee height to stop the livestock crossing. After 35 miles of running Angela couldn't work out how to get across it either. She wasn’t happy. She couldn’t lift her leg that high and wasn’t going to hurdle it. We solved the dilemma by ducking under one of the side railings. If she hadn’t liked the bridge, she was even more unimpressed when she saw the massive stile the other side. We were warned by our route instructions that the trail turned right into a hedge over a stile but it as was well hidden they’d try and mark it with tape. We trotted, stumbled and grumbled up the lane. Angela remembered recce-ing this section and missing the stile as it was so hidden. Every time there was a dip in the hedge we checked it out. We found fly tipping sites, rabbit holes and barbed wire. But no stile. Huh. It must be REALLY well hidden. We grumbled our way up the lane, dreaming of hot chips. Still no stile. Then we rounded a corner, and there ... surrounded by orange tape, bedecked by glow sticks like a drag queen version of a hedge was a gap and a stile. We climbed over it making the appropriate creaking noises and ran up the grassy strip into some woods, where a string of light bulbs hung like fairy lights to illuminate the dim woods. We came out of the woods and on our left was a hall, the finish of day one. As if to rub it in, we had to run the length of the fence all the while being able to see the checkpoint and the finish without being able to get to it. We reached the gate and got to the checkpoint. Angela’s husband was there with the promised chips and we were offered a big plate of beans by the lovely marshals. Bliss. The only problem was that we were now getting very, very cold. We were soaked through and we weren’t moving to keep warm any more. Some of the transported kit had arrived at the village hall but unfortunately my crate wasn’t among those there. Luckily the finish was approximately 2 minutes walk from the pub at which we were all to be camping overnight. They don’t believe in complicated addresses in Essex. The pub address was: The Star Inn, The Street, Steeple. Unfortunately my kit wasn’t at the pub either. My tent was but I wasn’t convinced that erecting and getting into a cold tent in wet gear was going to do me any good. Went back to the village hall and spotted some space blankets on the table. Wore my space blanket and pretending I was an astronaut briefly took my mind off the cold. While pretending to be an astronaut I spotted my kit in the back of a van! Hooray! Dragged it out and got into queue for shower when my name was called for a sports massage. I took my shoes and socks off and climbed onto the massage table (easier to write than to do) but while having my massage I spotted that I’d left a manky plaster on the floor. Nice, Sarah, nice. Luckily no-one trod on it and I managed to scoop it up and bin it after the massage. Ultra running. Such a glamorous sport. Massaged, I wandered into the toilets and got back into the queue for the shower. At least it was warm in here. I was warm, I was wearing a space blanket like a cape and I could stop running. Things were looking up. I finally got my shower ... which it would have been generous to call lukewarm, but it was perfect. The mud and rain water disappeared down the drain and I was dirt-free.